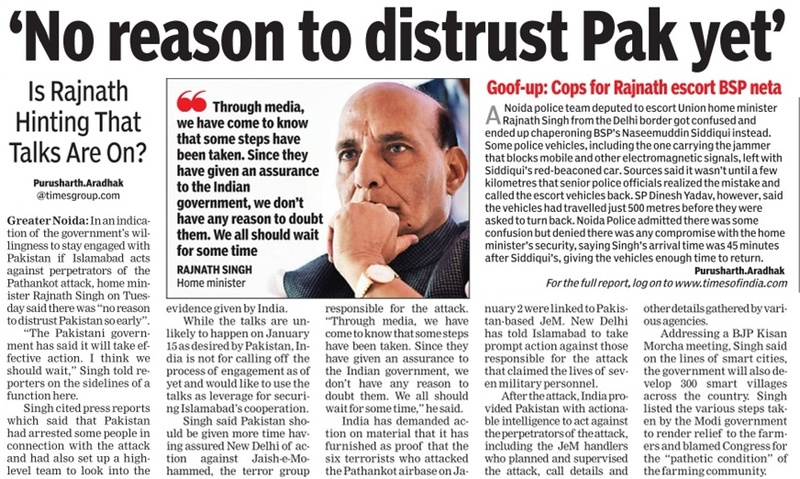 A day after Defence Minister Manohar Parrikar said those who had inflicted pain on India “would also feel the pain”, Union Home Minister Rajnath Singh today said there was “no reason” to distrust Pakistan’s commitment of “action” against perpetrators of the Pathankot attack. Insisting that since Pakistan has assured India, the minister said, there should be no reason to disbelieve them so early. 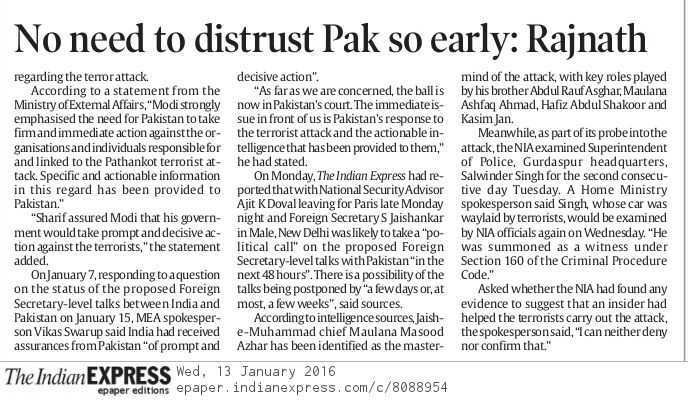 “There is no reason to distrust them (Pakistan) so early,” he said. After the attack, India had said it has provided to Pakistan actionable intelligence to act upon the perpetrators of the attack. 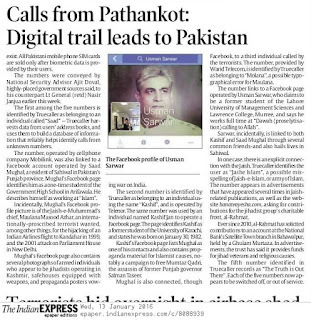 During a post-attack telephonic conversation between PM Narendra Modi and his Pakistan counterpart Nawaz Sharif, the government had said, “Our PM very strongly urged the Pakistan PM to take action”. 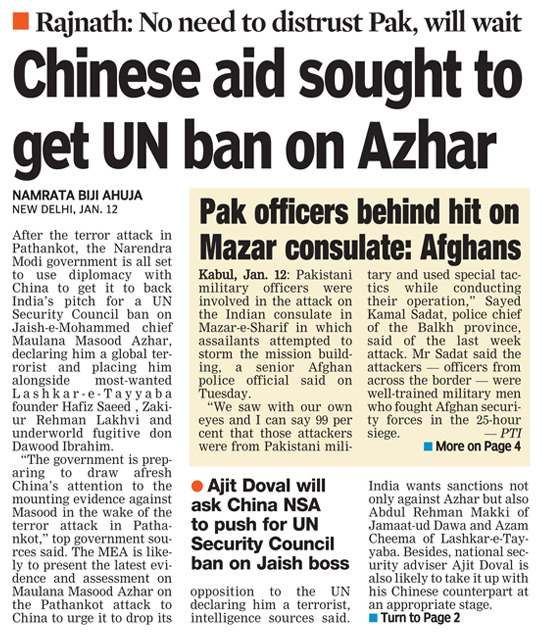 Meanwhile, reports from Pakistan yesterday said law enforcement agencies had picked up “some suspects” connected to the Pathankot attack from Bahawalpur district, the hometown of Maulana Masood Azhar, the chief of banned terror outfit Jaish-e-Mohammad. India has identified Masood Azhar as the mastermind of the attack. It also blamed his brother Rauf and five others for carrying out the attack that killed six terrorists and seven soldiers on January 2. In another development related to a nexus between the international drug smugglers and officials of the Border Security Force (BSF), the Mohali CIA wing arrested one more BSF personnel for facilitating the traffickers in smuggling at least 60 kg heroin and weapons from Pakistan, here. Giving details, Mohali Senior Superintendent of Police Gurpreet Singh Bhullar said the Mohali CIA wing arrested BSF head constable Prem Singh (45) for helping the international drug smugglers, Gurjant Singh, alias Bholu, and Sandip Singh, twice between August and November in 2014. Prem Singh had helped them in smuggling two different consignments, consisting of 30 kg of heroin each and foreign-made weapons from the Fazilka border, as he was posted there at that time. “Prem Singh had facilitated the smugglers by telling them his location of duty at the border and let the consignments be smuggled from that point. 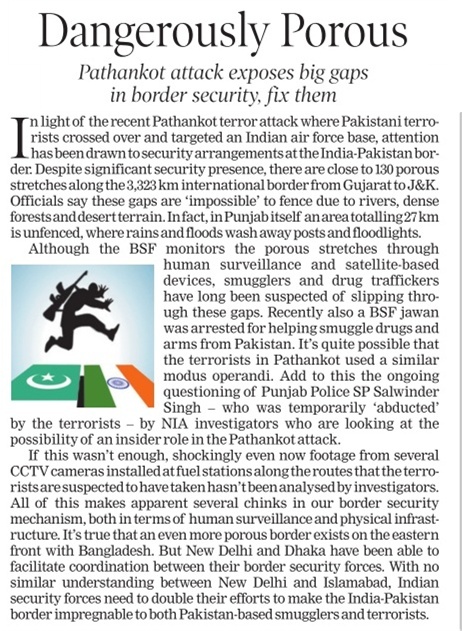 To make things easier for the smugglers, the official even used to divert the attention of his colleague by indulging in talks or even taking him for a walk along the border”, said the SSP. It is to be noted that with the arrest of Prem Singh, the number of BSF officials, involved in the drug trafficking case, has risen to two. The police had already arrested Anil Kumar, another BSF jawan, on the same charges on Thursday. Prem Singh, a resident of Nashehra Dhala village, located on the Taran Tarn border, has been arrested from his residence. 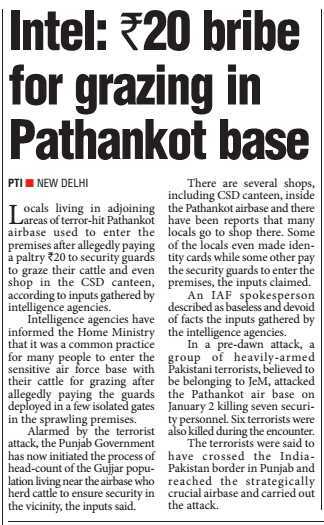 “Prem Singh, currently posted at Barmer in Rajasthan, had come home on leave”, said the SSP. The police have recovered a Nokia phone and two SIM cards from him. Bholu had given him the phone, SIM cards and Rs 50,000 for helping them in their nefarious activities. The police said a smuggler, Harchand, who died two months ago, had introduced Prem Singh to Bholu and Sandip Singh. A case under Sections 399 and 402 of the IPC and 25, 54 and 59 of the Arms Act, has been registered at the Kharar police station. The accused was presented before the Kharar court, which sent him on two-day police remand. The UT police arrested three persons after they tried to enter the 12 Wing, Air Force station, from a gate at Behlana. According to the police, the accused have been identified as Mohamed Ajim, a resident of Baltana, Mohammed Suhab and Imran Ahmed, both residents of Mani Majra. Police sources said the accused were triple-riding a motorcycle and when the security personnel deployed outside the 12 Wing gate tried to stop them, they accelerated towards the entry gate. Sources said the accused were interrogated by the Intelligence Bureau (IB) as well as Army officials. 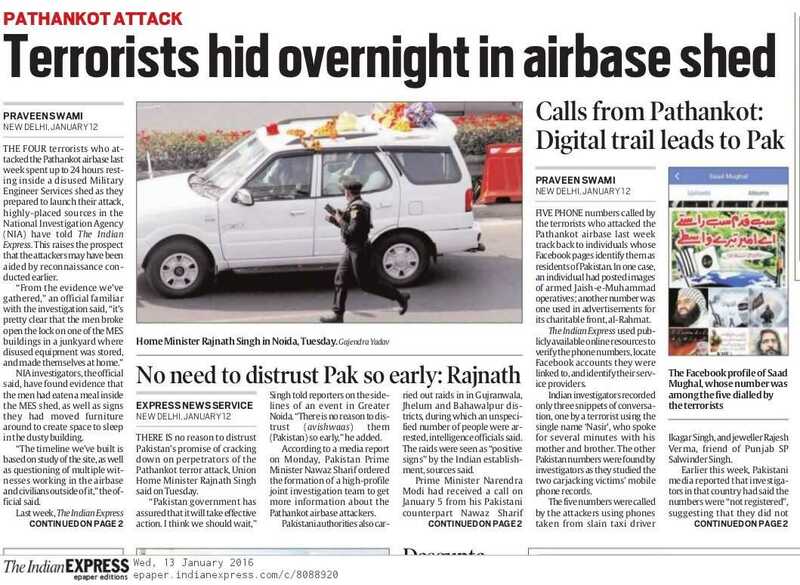 Police sources said the accused claimed that they thought of visiting the Air Force station. A case against the accused was registered at the Sector 31 police station. The accused were produced in the court and later, released on bail. In a setback for Pakistan, Republican-controlled US Congress has stalled sale of eight F-16 fighter jets to Islamabad, amid growing anti-Pakistan sentiments on Capitol Hill over its reluctance in taking action against terrorist groups. 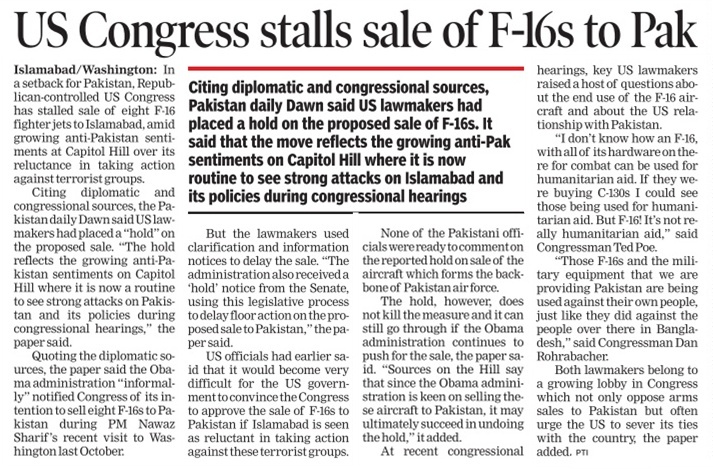 Citing diplomatic and congressional sources, the Dawn said US lawmakers had placed a “hold” on the proposed sale. 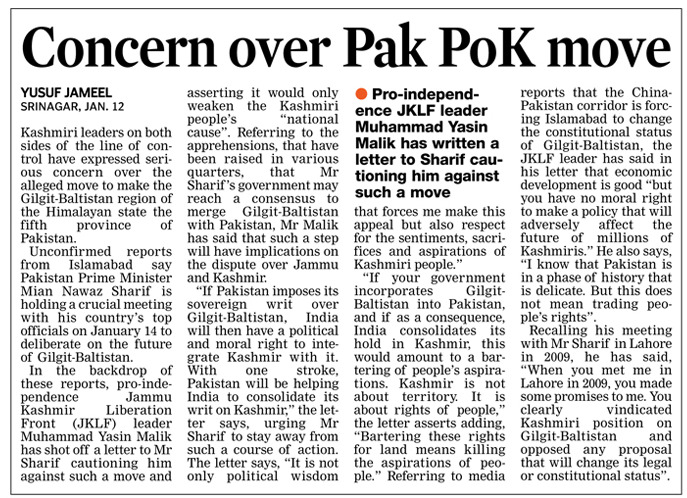 “The hold reflects the growing anti-Pakistan sentiments on Capitol Hill where it is now a routine to see strong attacks on Pakistan and its policies during congressional hearings,” the paper said. 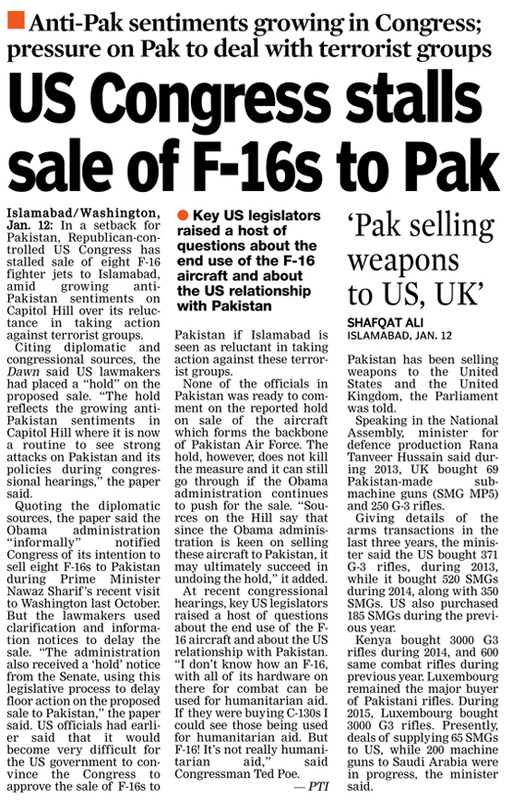 Quoting the diplomatic sources, the paper said the Obama administration “informally” notified Congress of its intention to sell eight F-16s to Pakistan during Prime Minister Nawaz Sharif’s recent visit to Washington last October. But the lawmakers used clarification and information notices to delay the sale. 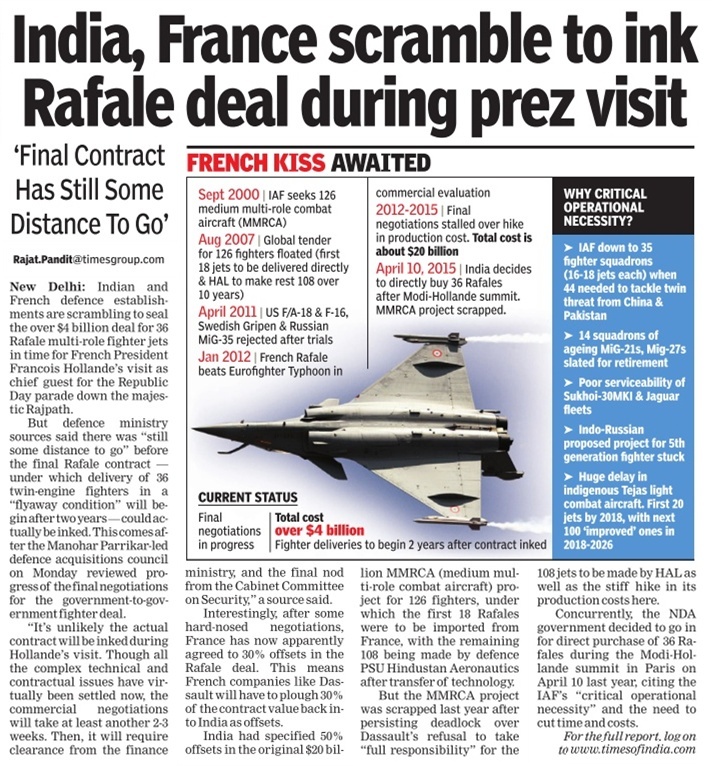 “The administration also received a ‘hold’ notice from the Senate, using this legislative process to delay floor action on the proposed sale to Pakistan,” the paper said. US officials had earlier said that it would become very difficult for the US Government to convince the Congress to approve the sale of F-16s to Pakistan if Islamabad is seen as reluctant in taking action against these terrorist groups. None of the officials in Pakistan was ready to comment on the reported hold on sale of the aircraft which forms the backbone of Pakistan Air Force. 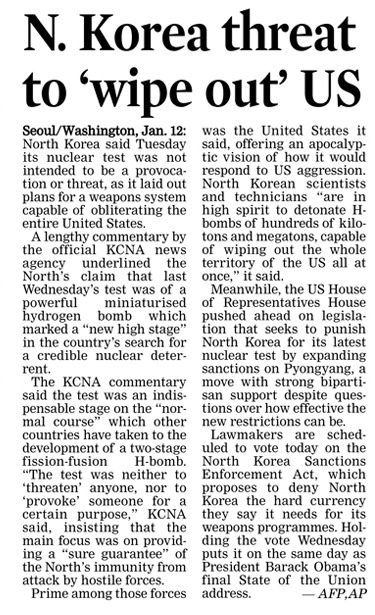 The hold, however, does not kill the measure and it can still go through if the Obama administration continues to push for the sale, the paper said. “Sources on the Hill say that since the Obama administration is keen on selling these aircraft to Pakistan, it may ultimately succeed in undoing the hold,” it added. At recent congressional hearings, key US lawmakers raised a host of questions about the end use of the F-16 aircraft and about the US relationship with Pakistan. “Those F-16s and the military equipment that we are providing Pakistan are being used against their own people, just like they did against the people over there in Bangladesh,” said Congressman Dan Rohrabacher. Pakistani military officers were involved in the attack on the Indian Consulate in Mazar-i-Sharif in which assailants attempted to storm the mission building, a senior Afghan police officer said today. “I can say 99 per cent that those attackers were from the Pakistani military and used special tactics while conducting their operation," Sayed Kamal Sadat, police chief of Balkh province, said of the attack that took place last week. Sadat said the attackers -- officers from across the border -- were well-trained military men who fought Afghan security forces in a 25-hour siege. 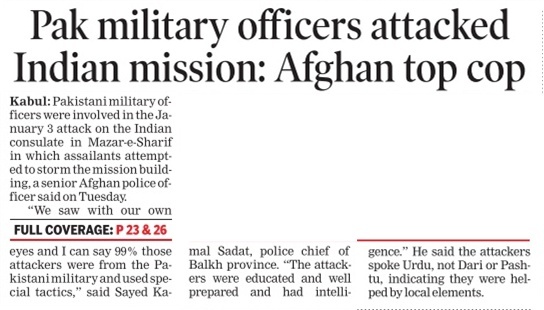 “The attackers were military personnel. They were educated and well-prepared and had intelligence. They fought us and only by Allah's grace were we able to control them and eliminate them,” Sadat was quoted as saying by Tolo News. The police officer said efforts were underway to track down, identify and detain those who assisted the attackers to gain access to the building that was opposite the Indian Consulate. "We are jointly working with the NDS (National Directorate of Security) director and have spoken about this -- especially as they came here not able to speak in Dari or Pashtu but speaking in Urdu. It means obviously there is someone who guided those attackers and helped the attackers," Sadat said. An intense gunbattle between the security forces and the attackers took place outside the Indian Consulate in Mazar-i-Sharif after assailants attempted to storm the mission building on January 3. Former Army Chief General VK Singh's (Retd.) 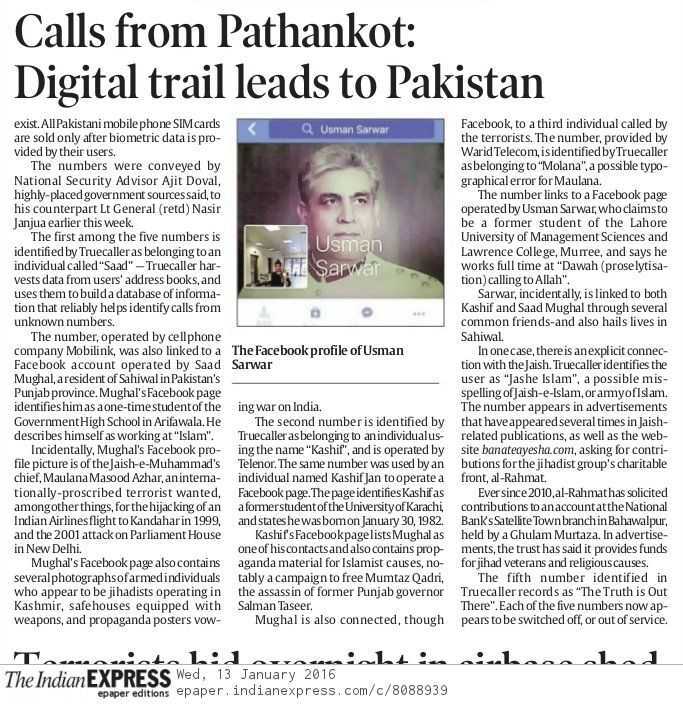 statement in response to Congress leader Manish Tewari's comment on the alleged movement of the Army troops towards Delhi in 2012 citing an Indian Express story. A certain right honourable out-of-work former MP a couple of days ago decided to make a straight-faced 'admission' to the People of India that the insinuated Coup story carried by a national newspaper in 2012 'was unfortunately true'. In my autobiography, Courage & Conviction, I had devoted two paragraphs to this ludicrous story, which had been written out of pique or on instructions of his mentor in the then PMO, by the editor of the newspaper (I believe he had felt insulted that there was another media person - who he considered inferior to him - present when he came to me to seek clarification about such rumours or the pique was because I had refused to do the Walk the Talk programme of his). 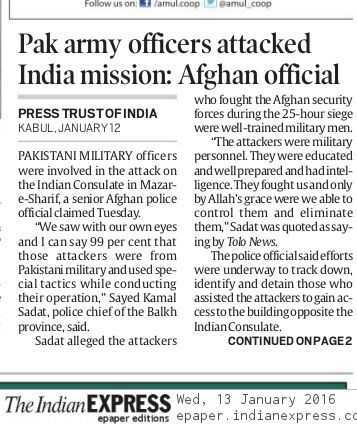 The 'story' that was subsequently picked up by the entire national media was nothing but pure bunkum and everyone in the chain of command knew it and said so. Mr Coupta, the editor, in question, had egg all over his face and even rookie journalists across the country were laughing at him. Mr Coupta, of course, having done the damage, has now spent the last few years trying to get away from the lingering smell of his own creation, which will probably haunt him for the rest of his life. Perhaps when his hour or reckoning comes, in his conscience the Coup story will have competition from the sensationalized article that he wrote about the Golden Temple attack in 1984. Anyone interested in seeing what he had to say then can easily get the story from the archives. He even had artillery firing from Jallianwala Bagh! 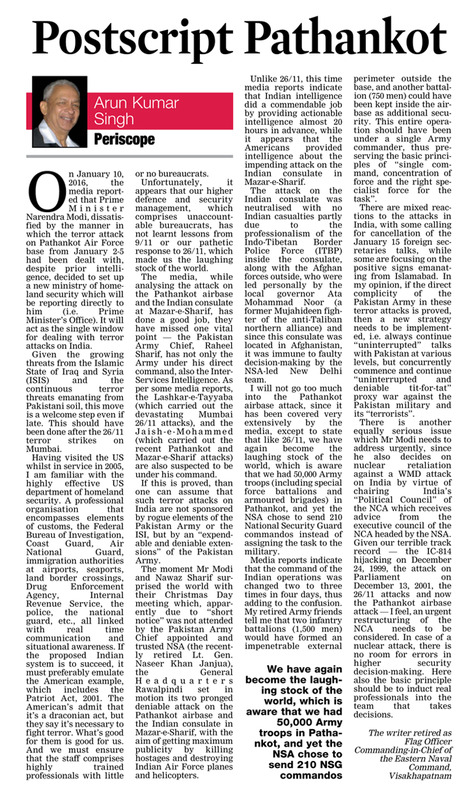 'National Interest' indeed!! Then along comes Mr T, until yesterday the brash face of the party in power, who despite knowing the facts of the case fully well, decides to brazenly tell a lie. He is much too intelligent a person not to know what he was doing or saying and he is a lawyer too. Let me also emphasize that by trying to get at me he has once again caused collateral damage to the 13 lac strong patriotic force that protects the country and so that he and Mr Coupta can sleep peacefully. In one stroke he has cast doubts not only on the integrity of this force but also of the government he was a part of and the then RM and PM - both men who are held in high esteem by his own Party. As has been the case in the past, there are plenty of Mr Coupta's colleagues out there who immediately focused on Mr T's remark and made shrill pronouncements on TV. Before I knew it, I had mikes being thrust at me from all quarters asking for a 'byte'. Despite being sick and tired of constantly defending myself from fabricated stories, I once again repeated that the story was pure rubbish and suggested to Mr T and his followers to read my book. Mr T promptly retorted that he will certainly do so if I promise to read his book, which is in the offing, whatever that means! Normally, out of politeness and as a courtesy to a fellow human being, I would agree. But in Mr T's case, I see no reason why I should, since he has already established, in the one stroke of opportunistic sensationalism, that he has absolutely no regard for the truth. Since we are talking of military literature, may I suggest that Mr T reads General S. P. P. Thorat's From Reveille to Retreat (republished version is in the offing), Brigadier John Dalvi's Himalayan Blunder and the more recent book by Shiv Kunal Verma 1962: The War That Wasn't. If he is honest with himself and can rise above being a blind camp follower, he will see what the cynical politics of his forefathers did to this country half a century ago. Using the bogey of a military coup and then by politicizing one of the finest armies in the world, his party presided over an absolute disaster and it was men from my own battalion, 2 Rajput, who paid the price with hundreds of other soldiers. We lost 282 men in one hour while the remainder were wounded and were made POWs. There were just a dozen or so survivors - that is why I'm getting 'antsy'. My sworn oath to protect this country means one has to not just look beyond the borders but also tackle the likes Mr T and Mr C.
It's a vicious circle - Mr T gives Mr Coupta a certificate on the bidding of some vested party; Mr Coupta goes on TV to give Mr T a slap on the back for being a politician who has the guts to back him up and hey presto, the world is a happy place as Mr T and Mr C are both back in the headlines. Apart from the venerable old Mr Mani Shankar Aiyar, the wise one who asked Pakistan to help him in bringing down the elected Prime Minister of this country, I really cannot hear anyone even from Mr T's party applauding. As for the media, especially a particularly shrill channel that seems to have a single point agenda where the anchor suffers from a regular period of outrage everyday at 9 p.m., my simple advice is please grow up. This was a laughable story in 2012, it is a laughable story today. May I remind you that in the words of Rudyard Kipling, the unforgiving minute is sixty seconds worth of distance run... so please stop wasting the time of this country. There are too many pressing problems that need attention. Leave some of us alone to do our job. New Delhi: An hour-long special programme to celebrate the Army Day on 15 January and to honour the heroism of the Indian soldiers posted at the Siachen glacier will be premiered on television on 26 January. The show titled "Revealed: Siachen" will be aired on Discovery Channel. "'Revealed: Siachen' is dedicated to every Indian soldier for their valour and sacrifice for the motherland. The programme will offer viewers first-hand testimonies from the soldiers who have been at the battlefront," Rahul Johri, executive vice president and general manager - South Asia, Discovery Networks Asia Pacific, said in a statement. The show will take viewers through the extreme frontline and the highest battleground in the world and what it takes to keep the Siachen glacier secure and peaceful. The show will present chronicles of the soldiers and their challenges to manage the battlefield where temperatures often reach 60 degrees Celsius below the freezing point.